The first event – which combines community members and worship in collaborative artistic creation – will be on Palm Sunday, April 14, at 7 p.m. on Thomas Plaza. 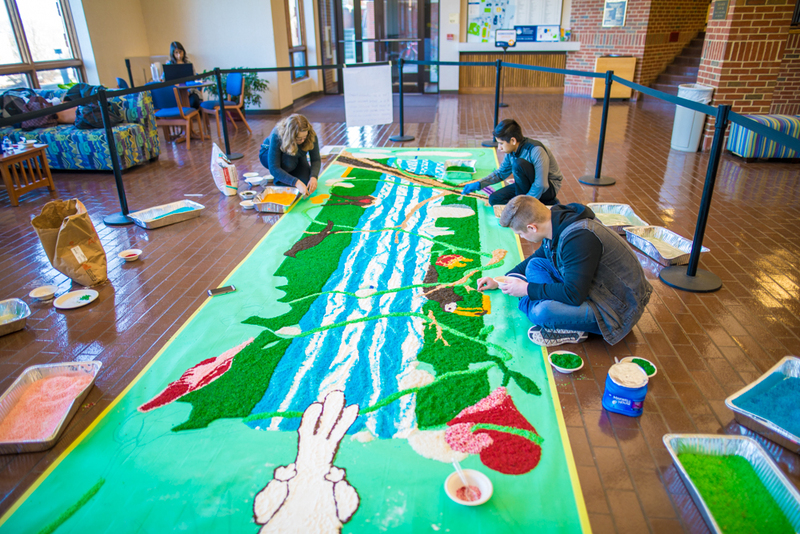 The second event on Wednesday, April 17, highlights the traditional alfombra created during Holy Week by EMU’s Latino Student Alliance. This is the fourth year LSA has created the artwork and hosted the service, which takes place in EMU’s campus center from 10:10-11 a.m.
Communities in Mexico and Central America decorate their streets to commemorate Jesus’s welcome into Jerusalem the week before his crucifixion. Traditionally, community members gather in a processional to walk over the alfombras on their way to church. For the past three years, LSA has created one of these expansive and colorful works of art on the EMU campus. The process begins months before, with the selection of a theme and the symbolic elements. Materials, including coffee grounds, rice, sawdust and flour, are gathered and prepared. Teams of students spend many hours patiently contributing to the finished work. LSA’s alfombra provides a beautiful centerpiece for a mid-week Holy Week service during which worshippers walk together around the art, stopping to listen to scripture readings, participate in a litany, and sing hymns together in English and Spanish. After so many hours of labor, the alfombra remains intact for viewing and reflection. LSA’s tradition of creating the alfombra inspired the idea to create what Burkholder is calling an “interactive alfombra made of found materials from the natural world” on Palm Sunday. Participants are welcome to bring their own materials to contribute, such as wood chips, sand, gravel, branches, or flowers. A design will be present, but there will also be open space. Weather permitting, Thomas Plaza at the center of campus will be the site. If rain or wind is likely, the event will move inside.